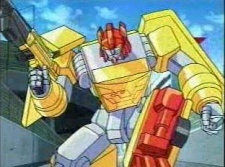 was introduced in the Robots in Disguise toyline as a member of the Spy Changers team. He is described as the tactical officer of the Spy Changers and Hot Shot's close advisor, as smart as he is fast and extremely observant. R.E.V. can leap from building to building with such skill that he appears to be flying, and his main weapon is a shotgun.